We know that HR can be challenging, especially for non-profits with limited budgets and high numbers of volunteers and part-time staff. CiviHR is a non-profit, open source, cloud-based software, designed to be affordable and easy to use while still providing all the features expected from a comprehensive HR solution. You can use CiviHR online for free for the first three months. After that, it will cost £1 per user account per month with unpaid volunteers remaining free of charge. You can cancel at any time and take away a copy of your data. Members of staff can log in to their Self Service Portal at anytime, from any location, and on any device. From here they can apply for leave, edit their contact details, check internal job vacancies, read policy documents, look up the staff directory, and view any tasks assigned to them. 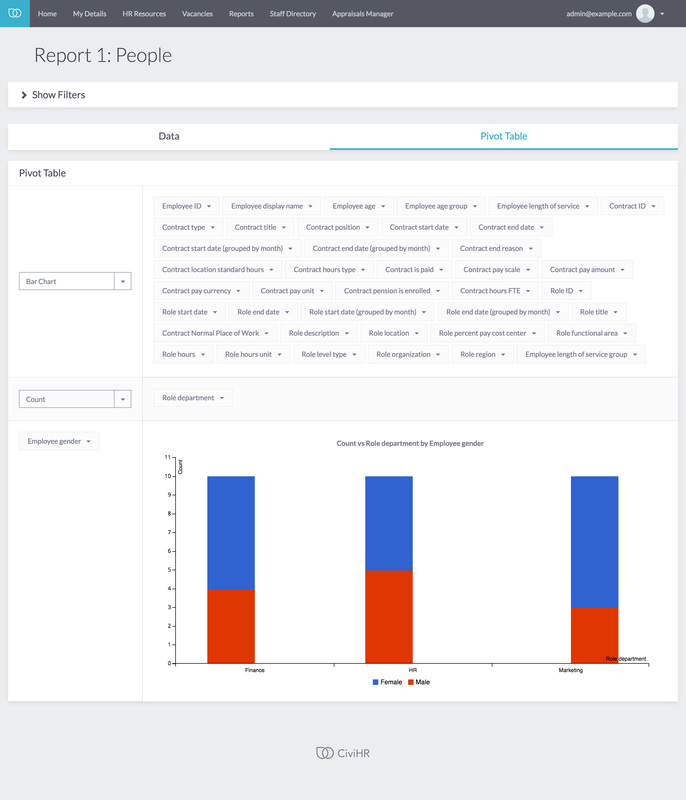 Choose from a list of standard reports or create your own interactive tables and charts using our drag and drop tool. Share these online with colleagues, download them to other formats such as CSV, or simply print them out. Store the key details about each staff member, such as their identity, home address, emergency contacts, and right to work. You can look up the terms of their current job contract, update to reflect a recent pay rise or search through the history of past revisions. 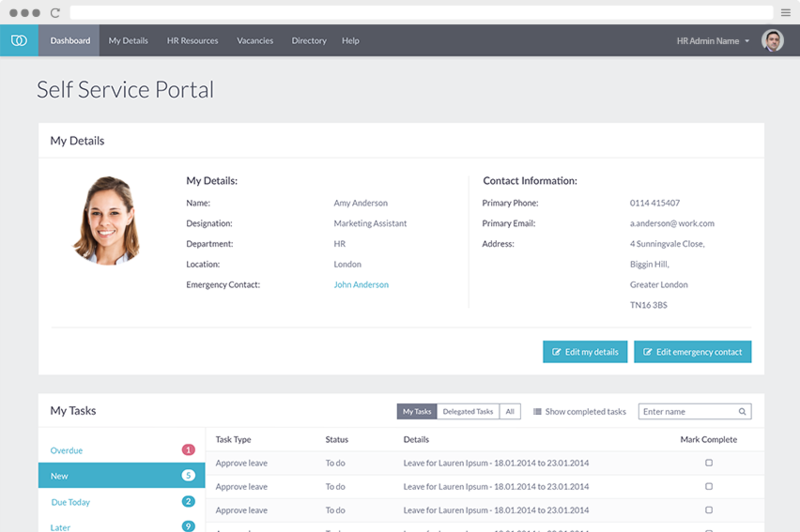 Staff can submit leave requests via the Self Service Portal, and managers can approve online. Choose from Holiday, Sickness, TOIL, Parental, or define your own leave types. We support flexible working patterns for part time and casual staff with leave entitlements calculated on a pro rata basis. 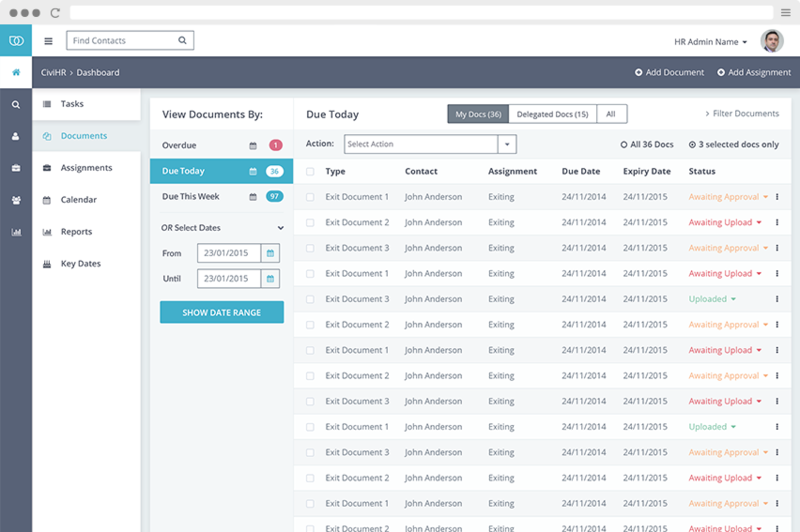 Upload copies of documents, such as passports, contracts, and driving licences. Alternatively, staff can do this themselves from their Self Service Portal. Record expiry dates of documents such as visas, so that HR can be reminded when it is time to renew. Create a list of tasks that must be completed whenever a member of staff joins or exits the organisation. 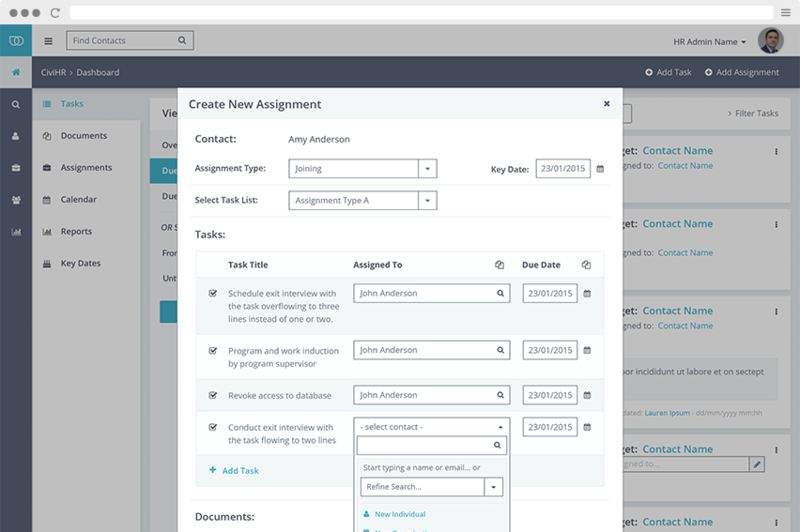 Set due dates on these tasks, and assign them to the relevant managers. Track progress through the dashboard so you can make sure that everything is finished on time. These are the next modules that we are working on and we welcome feedback from any organisations interested in influencing their development. You'll soon be able to integrate your leave requests with Google Calendar. 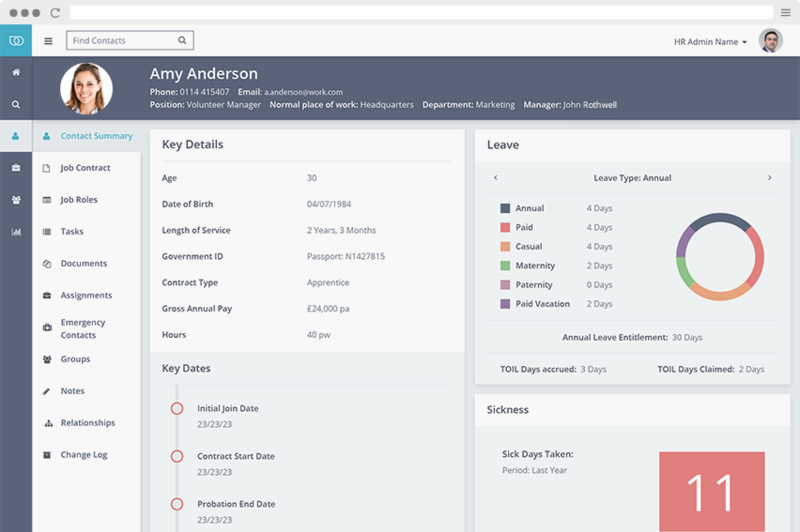 Check upcoming leave without having to log into the system or duplicate information across multiple platforms. 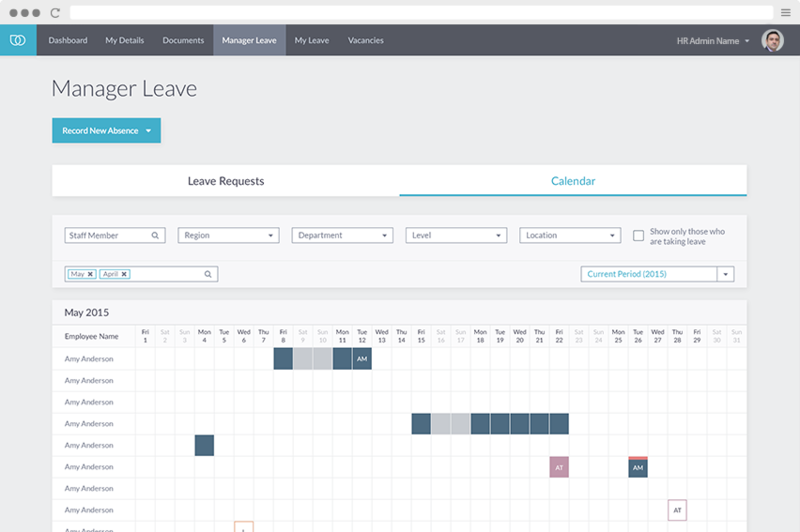 Flexible permission levels allow employees to view dates for their own leave, the leave dates within their team, or leave for the entire organisation. We are redesigning the Self Service Portal so that it appears much more like a mobile app when viewed on a smartphone. Less information will be displayed on each screen, making it clearer and saving the need for lots of scrolling. By clicking on an item of interest, you will move to another screen that displays more detail. The project is developed by Compucorp, a London-based digital and design agency that specialises in creating solutions for non-profits that are based on open source software. 'We like to build stuff, sometimes complicated stuff, for people who like to make a difference. For us its all about helping our clients do more with their online presence. We use open source to make a real difference in people's lives'. The project manager is Drishtant, a Mumbai consultancy that applies the principles of frugal innovation to make technology affordable to charities without compromising quality. 'Organisations in the social sector put tremendous effort into mobilising resources to change the world. We believe that these resources can be utilised more efficiently by using appropriate technology. We help organisations to use technology, and save time and funds, thereby delivering stronger social impact'. CiviHR makes use of code from CiviCRM, the third sector's leading CRM software. CiviCRM is built and maintained by a global community of tens of thousands of contributors and supporters for the benefit of non-profits worldwide. The CiviCRM vision is that all organisations – regardless of their size, budget, or focus – have access to an amazing CRM to engage their contacts and achieve their missions. CiviHR is the initiative of Robin Tombs, a successful serial entrepreneur, who has a personal commitment to giving back. He provides all of CiviHR’s funding and he is committed to the long term success of the project. Having been involved in the development of an internal HR system for use at one of his companies, and having experienced the benefits that it brought to both management and staff alike, he was constantly surprised when, in conversations with the CEO’s of non-profits, as to how few were enjoying the benefits of similar systems. Too often the reason given was that HR systems were considered to be unaffordable for non-profits. Robin’s response to this was to launch the development of CiviHR as affordable HR software for non-profits. CiviHR is open-source and is itself built using a number of open source softwares, including Drupal and CiviCRM. Robin is a firm believer that through making software open source, the benefits can be shared with people everywhere. Robin lives in the UK with his wife and three children. His business efforts are currently focused on Yoti, a digital identity app that is revolutionising the way people identify themselves online. He also provides grants to other technology projects that benefit the third sector via Zing, a charitable foundation. Animal Equality is one of the leading farmed animal protection organisations in the world. Founded in 2006, they focus on research-based interventions to bring about incremental change for farmed animals. To this end, they employ highly-qualified professionals with years of experience in undercover investigations, corporate campaigns, political outreach and the development of large-scale education programs. Friends Provident Foundation is an independent grant-making charity that focuses on exploring the role of money and financial systems as a force for social good. They aim to create improved access to financial services for those who are currently excluded, particularly those on low incomes, and to contribute to an economic system that is both fairer and more sustainable. Right to Succeed is a charity with a mission to eliminate the effects of poverty and system failure upon the achievement of young people, giving every child the Right to Succeed. Our approach is to bring together best practice educationalists & deliverers, philanthropists, government commissioners, and social investors to develop, pilot and scale solutions to educational inequality. We’d love to hear from you! Whether you’re looking for a new HR system or to change from your current one, we’ll show you how your organisation can benefit from CiviHR. Just fill in the simple form below to help us understand a little bit more about you and someone from our team will be in contact shortly.